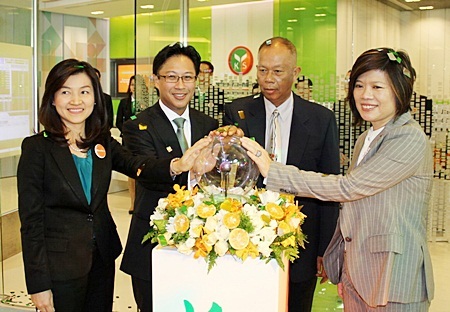 From left, Ms. Natharin Tanthong, President of Kasikorn Securities Co., Ltd., Krisada Lamsum, Deputy Managing Director of Kasikorn Bank, Deputy Chiang Mai Governor Worakarn Yokying, and Ketsara Matchusri, Assistant Manger of the Stock Exchange of Thailand moved the crystal globe to open Kasikorn’s new full finance and investment services center with a Stock Exchange of Thailand (SET) Corner and the Wisdom Lounge of Kasikorn Securities company under the Kasikorn Bank Group at Central Airport Plaza in Chiang Mai recently. 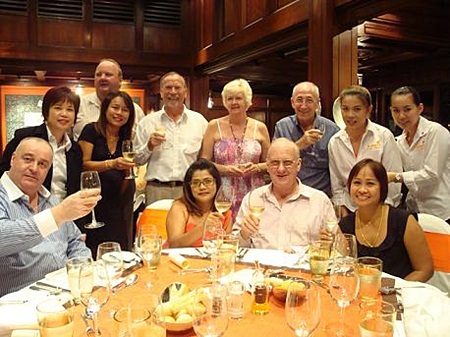 Wine lovers joined Warunee Khameru, Assistant General Manager of Amari Rincome Hotel and Anuchit Saeng-orn, Marketing Manager of Italthai Co., Ltd. at the dinner party titled “Celler de Capcanes Exclusive Wine Dinner”they recently hosted at the hotel’s La Gritta Restaurant. Recently, Thai Beverage led by Khun Thapana Sirivadhanabhakdi, Director and Executive Vice President, organized a thank you party to all Thai Beverage dealers nationwide at Le M้ridien Chiang Mai’s Convention Hall. 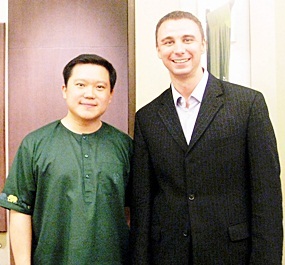 Khun Thapana is welcomed by Mr. Tino Lindner, Manager of Le Meridien Chiang Mai.